1. US ranked 139th in voter participation of 172 world democracies in 2007. 2. Only 10 percent of US citizens contacted a public official in 2009‐10. 3. Only 24 percent of graduating high school seniors scored at the proficient or advanced level in civics in 2010, fewer than in 2006 or 1998. 4. Less than one‐half of 12th graders reported studying international topics as part of a civic education. 5. Half of US states no longer require civics education for high school graduation. 7. Opportunities to develop civic skills in high school through community service, school government, or service clubs are available disproportionately to wealthier students. 8. Just over one‐third of college faculty surveyed in 2007 strongly agreed that their campus actively promotes awareness of US or global social, political, and economic issues. 9. A similar percentage (35.8 percent) of college students surveyed strongly agreed that faculty publicly advocate the need for students to become active and involved citizens. 10. One‐third of college students surveyed strongly agreed that their college education resulted in increased civic capacities. 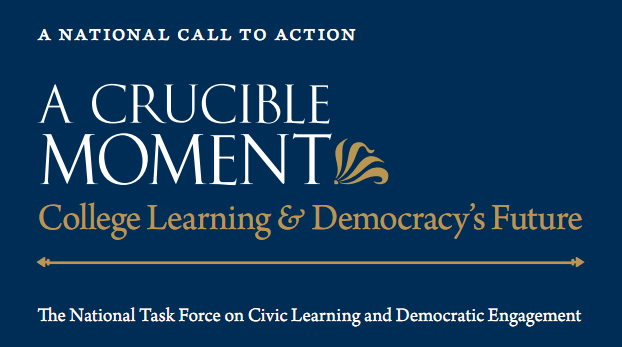 You are currently reading A Call to Action and Report from The National Task Force on Civic Learning and Democratic Engagement at Maxim Fetissenko.